LoggerNet DB (LNDB) is ideally suited for transitioning data from LoggerNet’s data cache to a relational database of your choice. Publishing user-selected LoggerNet collected data to these relational databases enables data administrators to share their data with a large customer base across various platforms and methods. Those platforms could include custom websites (including those developed with RTMC and CSIWEBS), custom data reporting systems, data warehousing, and customer software (web and desktop) applications. This application is for data network administrators that want to push their valuable LoggerNet data into relational databases and have that data published in real time (as often as the data is collected). The low-cost LNDB software is simple to set up and administer and gives you the flexibility you need for your organization. Most users can have the software installed and LoggerNet data uploading to their relational database in less than 20 minutes' time (assuming the database and LoggerNet are set up and proper credentials are issued to the data manager). 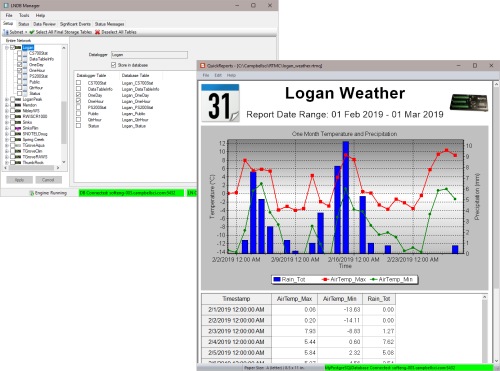 After setup, LNDB runs as a service on Windows and continues to reliably push LoggerNet data to the relational database, allowing you to focus your time and energy on other projects. LNDB can be run as a service on the workstation or server. This ensures that when the computer is restarted, LNDB is automatically started without human intervention. This allows data ingestion from LoggerNet to the relational database to continue after unforeseen power issues or automatic operating system updates. LNDB Manager is the main client screen used to configure the LNDB engine. It is used to determine which LoggerNet system to connect to and which database is used. LNDB Manager can also be used to watch the status of various data collections and data push events. Data can be reviewed in tabular columns directly from the database without having to use database-specific tools. Status messages and Significant Events can be viewed using LNDB Manager as well. DBExport is a database client that can be used to retrieve data directly from the relational dabase. Users can pull all the data from the database or select data using data ranges. EDExport also has the ability to check for and inform the user of missing records for the exported data. Exported file formats include TOA5, TOACI1, TOB1, CSIXML, and Custom CSV. DBImport is a database client that can be used to import data from existing data files. The user can ingest the data into an existing table or create a new one in the database. These data files can be either those created by LoggerNet or database files from other sources or data loggers. QuickReports is another database client that can be used to generate simple reports and graphs with data from the relational database. Required Framework This software requires the Microsoft .NET 4.6.2 (or better) Framework to run properly. To use the reporting functions of LNDB 2.0, Microsoft .NET Framework 3.5 also needs to be installed. If the required version of the .NET framework is not already installed on your computer, it can be obtained from the Microsoft Download Center. Note: LNDB may work with other versions of SQL Server Express, SQL Server Compact, or MySQL. LNDB runs on Windows® 10, 8, or 7 and Windows® Server 2012 R2* or 2016*. *Users using Windows® Server with security policies other than the default policies will need to work with their IT administrations to resolve any security issues. A fully functional 30 day trial version of LNDB (LoggerNet DataBase) software. Note: This application requires the Microsoft .Net 3.5 and .Net 4.6.2 Frameworks. If they are not already installed on your computer, they can be obtained from the Microsoft Download Center. Is there a stored copy of LNDB “Significant Events”? How can the Windows Authentication that LNDB uses be changed from a host name (computer name) to a user name? The LNDB service runs under a local system account by default, which may be why it uses the computer name. Go to Control Panel | Administrative Tools | Services and set it to run under a user name. Can LNDB be connected to the database software FileMaker? No. For information about creating live connections to Microsoft SQL Server, Oracle, or MySQL data sources with FileMaker Pro’s External SQL Data Source feature, visit the FileMaker website. Can LNDB be used to upload data gathered from LoggerNet to a remote Linux MySQL server? Yes, but LNDB can only run on a Windows platform. Run LNDB on the same Windows host on LoggerNet, and post the data to MySQL running under Linux. Configure LNDB (running on Windows) to point to the MySQL server running on Linux. What happens when data logger table definitions change in LNDB? Is there a way to establish connections between LNDB and two different database hosts at the same time? Not at the same time. Currently, a user would have to manually switch back and forth between the database hosts periodically using the File menu Select Database... option to keep them both updated. Which port needs to be open to enable LNDB to communicate with the LoggerNet server? The LoggerNet default port number is 6789. If a command line argument has been used to change the LoggerNet default port number, this alternate port number must be open. Note: The alternate port number must be specified in the Login to LoggerNet Server dialog box when entering the Server Address (for example, 192.168.7.123:6700). Can LNDB automatically connect to a remote LoggerNet server? With LoggerNet and LoggerNet Admin, remote connections are not enabled by default. They have to be enabled in the LoggerNet Toolbar. Right-click anywhere on the toolbar, and, in the resulting dialog box, verify that Allow Remote Connections is selected. Is there any way to save the RTMC Alarm Log to LNDB from within the LoggerNet environment? The easiest way to get the data into LNDB is to store the information in the LoggerNet data cache (or, for the information to be in a format that looks like a data logger data file to LNDB so that it can be imported). Is there any way to change the LoggerNet Server that LNDB uses without using LNDB Manager? No. It can only be changed using the Login to LoggerNet Server dialog box. The Login to LoggerNet Server dialog box opens automatically after LNDB is installed. It can also be opened at any time from the File | Select LoggerNet Server menu item or by double-clicking the LN Connection Status Label on the Status Bar.